Several years ago I started questioning the ingredients in personal care products. Questions like "what's the deal with blue dye in this shampoo?" and "why is this fragrance lasting so long and causing me to sneeze?" prompted me to start Googling. After finding plenty of scary answers about the abhorrent lack of regulations on products and ingredient disclosure, I became much more conscious and picky about what I was purchasing and using. Fortunately, over the last few years, many products have emerged into mainstream retail, making it much easier to find great products and support well intentioned companies. It's important to read these labels yourself and know what tricky items to look out for. Clever marketing can disguise harmful additives and may lead people to believe they are making a safe choice. At a later date I will create a post with details on specific toxic ingredients to avoid, but for now here is a quick list of my personal Top 5 Shampoo Choices. Sincere recommendations: This list contains only products I have used personally and continue to rotate use of, depending on when and where I shop. Easily available on Amazon, natural grocery stores like Whole Foods, or even conveniently at chain drugstores (CVS, Walgreens, etc.). Budget conscious: generally, natural products tend to be more expensive, but that is not a fixed truth. Many salon brands with highly effective claims and followings are triple, or quadruple the price of the brands below, and have way more yucky additives you do not want to pay for. Great reviews on Amazon- proof these products have been a great choice for many others! Why you will ♥ it: The ACURE brand makes some amazing all natural options and seems committed to consistent quality, availability, and affordability. In my opinion, this stuff smells amazing! Kind of like sweet almond yumminess mixed with coconut. It's not overpowering, but very pleasant. The consistency of the product creates a nice lather, and rinses easily. The accompanying conditioner does a nice job smoothing, and post-shower hair feels soft, clean and natural! Availability: This can be found on Amazon, or in store at Whole Foods, Target, King Kullen/Wild By Nature, and other health food stores. Price: $23 on Amazon will get you both the 8oz Shampoo AND 8oz Conditioner. That leaves you with a per ounce cost of about $1.44. Why you will ♥ it: There are so many reasons I continually stick with this brand. The quality is consistent. The price is super reasonable considering the caliber of ingredients they use. The raw shea butter is my absolute favorite scent in their product line. Overall, the claims deliver on their promises. This will leave your hair baby soft and moisturized. They also make a leave in hair mask which is amazing for frizzy and damaged hair. Having made an effort to do the right thing from the get go, this is a company you'll feel good about supporting! Availability: One HUGE reason I also love this product: the fact that they have gotten placement in MANY major stores. I have found this in a pinch at Rite Aid, CVS, Target, King Kullen to name a few. Of course you can also buy online at Amazon. Price: $19.99 on Amazon for both 16oz shampoo and 16oz conditioner. That's only $0.62 per ounce for some super trustworthy hair product! Promising Amazon Review: "YOU GUYS- The ingredients in this are really pure, natural, partially organic, and you really cannot beat the price. I researched shampoos and conditioners for hours- literally. I was using the EWG website and amazon reviews to narrow down my search. Most of the products I ended up with were a fortune! (mostly because I was going for organic ingredients). I knew about this brand and shampoo and conditioner set right at the start of my search because it has great reviews overall and because it has a really great EWG rating, but I was hesitant my hair would be dried out by it based on some of the reviews. I AM TELLING YOU- use it for a week and you will love it. The combination of natural, organic, safe ingredients and the price make this set hard to beat. I really never write reviews unless I love something. And I fell in love with this after the first time I used it and it has only gotten better since. The shampoo really cleans my hair and the conditioner makes my hair so, so soft. The smell is nice- a little musky, but I still like it. Why you will ♥ it: Burt's is a fantastic brand and generally always a safe bet in terms of quality and safety of ingredients. I love using their baby shampoo to bathe our little golden doodle! This particular style is my go-to during the warmer months. Light and moisturizing, the light scent is so delightful and basically smells like they captured and bottled the "never ending summer" poster. Availability: You should have no trouble finding Burt's Bees in local and national drug store chains. It's also readily available at many grocery stores and on Amazon. Price: $25.09 on Amazon for both the 10oz shampoo and 10oz conditioner. Your per ounce price on this yummy summer shampoo is $1.25. Why you will ♥ it: Another ACURE product I couldn't leave out. This is a great brand all around (be sure to check out their skincare line too) as they leave out parabens, sulfates, silicone, sodium chloride, phthalate and synthetic fragrances. This shampoo and accompanying conditioner smell so delicious you'll look forward to washing your hair. Light and moisturizing, this is a great product to use year round, but I especially love it for late summer and fall. Price: At $7.70 on Amazon for the 12oz shampoo, you can have a heavenly shampoo for only 0.64 per ounce! Get the matching conditioner for $8.99 on Amazon. Why you will ♥ it: Spending time at the ocean is so beneficial but can be hard on your hair. This is a staple during the summer for aprés-beach. It removes chlorine, salt, pollution, and grime, with soothing cucumber and aloe vera shampoo and conditioner ingredients that moisturizes and comforts. This brand is baby-focused but works well for grown-ups too! Price: For $34.41 on Amazon, you receive the 8oz. Shampoo and 6oz Conditioner as a set. This works out to $2.46 per ounce. A bit pricier than others on the list, but well worth it to manage salty, sweaty, sandy locks. 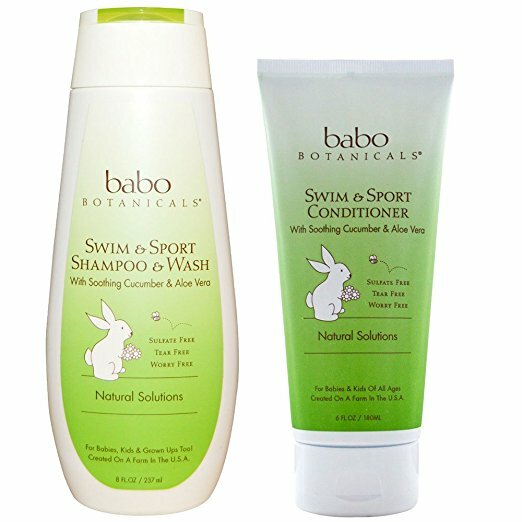 Promising Amazon Review: "Love this shampoo and conditioner, I use it 3 times a week and it avoids drying out my hair from swimming. I'm an adult and use this kids version since I didn't find another adult version available." Love these picks? Is your fave non-toxic shampoo or conditioner not on this list? There are so many great brands to explore. Comment below to let us know what you use!